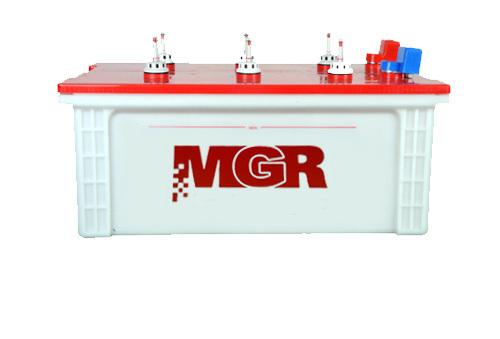 MGR tubular batteries are manufactured using European and American machinery which is what differentiates MGR from other brands. The technology we use is proven to produce batteries with long life and superior performance. Electrolyte level indicator to ensure ease of Maintenance. In a position to manufacture these grids with special low antimony selenium hybrid alloy that are free from blow holes, have dense uniform grain structure, high mechanical strength and good dimensional accuracy. The active material is manufactured in house using virgin lead. This active material is encapsulated in between the grid and pluri tubular bag which snugly fits on the grid and the open end is sealed with plastic bottom bars. This construction retains the active material intact and prevents shedding of active material during long service life of the battery. Negative Plates : The negative plates are of pasted type with sturdy grids and the active material is a blend of oxide, special additives/binders and expanders which aids in better voltage build up and charging characteristics. Aqua trap vent plugs : R.D.S.O. Approved aqua trap vent plugs are used. These Vent plugs prevent the electrolyte loss during charging of the battery. P.P Battery Case : Batteries are assembled in Polypropylene containers which imparts aesthetic look to the batteries. Intercell connection is established by fusion electrical resistance welding process. Enhances the life of the Battery, prevents leaching of antimony into the Electrolyte whereby self discharge is minimum. Renders low maintenance characteristics to the battery and hence less topping up. Builds adequate back emf and resists over charging. This protects the charging system apart from savings on electricity. Increases life span of the battery. 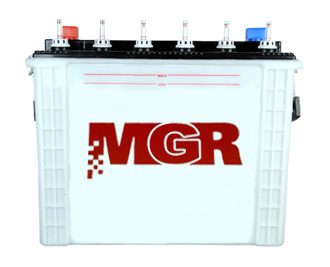 Renders the batteries suitable for deep discharge applications. As they have good mechanical strength and are free from pin holes chances of failure of battery on this account is not there. Since Poly-ethylene Separators have High Porocity & Low Electrical Resistance, the voltage drop across the terminals when the battery is on load is less. Reduces temperature build up inside the battery . Increases power output from the battery. Prevents electrolyte loss during the charging process by trapping the acid mist. The surrounding atmosphere will be free from acid fumes. Reduces the topping up frequency. The batteries are much lighter and attractive. There is no sweating of the electrolyte. 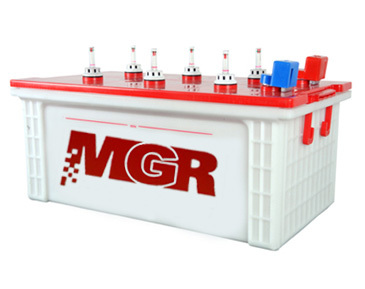 Reduce intercell resistance of the battery. Prevents heating up of battery while charging and discharging. No loose contacts within the battery. For initial charging, follow instructions printed on the battery. Install the batteries on an insulated surface such as a sheet of Rubber or Wooden Plank. Electrical connections should be secure to prevent sparkling & melting of terminals. Take care not to offer much load on terminals while tightening. Take care not to short circuit the terminals while tightening. Apply white petroleum jelly to the terminals to prevent corrosion. Batteries should be installed in well ventilated place sheltered from sunlight. Do not bring fire hazardous material, flame, lighted cigarettes near to the battery as there is chance of explosion or injury. Keep the surface of the battery clean & tidy. Check the electrolyte level periodically & top up with distilled water only if required. Never use acid to top up. M.G.R. Technologies is equipped with sophisticated machinery, majority of which are imported from world renowned machine manufacturers. We have mechanised the entire manufacturing process to ensure consistency in quality and reduce the scope for human error. All the critical components that go into each battery are produced in our Peenya facility, right from the raw material stage, thus, ensuring that every battery leaving our plant is of superior quality. 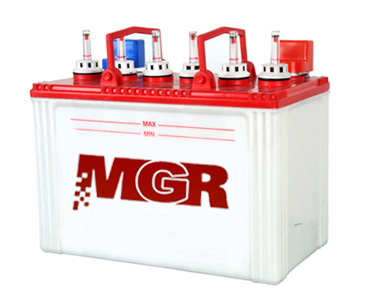 The specially formulated alloy of selenium, antimony, tin and lead imparts low maintenance characteristics to the battery by reducing the frequency of topping up and preventing overcharging of the battery. Our positive spine grids are cast using cutting edge German technology on “HADI” pressure die casting machines. This imparts a dense grain structure to the grid, preventing grid corrosion. Hence, the service of the battery is high. The positive plates are filled with high density (1.6-1.9 g/cc) lead suboxide, manufactured in house using German ball mills. Owing to this shedding of active material is prevented and hence our batteries deliver optimum capacity throughout their service life. The negative grids are cast on “WIRTZ” (USA) autocasting machines. This ensures a uniform grain structure and thickness of the negative grid. The negative grids are further pasted on “HADI” (Germany) pasting machine making sure that the negative active material is tightly packed in the grid pockets for perfect binding of the active material to the grid structure. Intercell welding machine with 'MIYACHI' weld controller ensures seamless intercell connections. Every battery is subjected to weld testing, short circuit testing, and leak testing before leaving the assembly line. Our batteries are assembled in a full-fledged assembly line with “SOVEMA” (Italy) and “LEKO” (Australia) machines and an X-Y axis conveyor system ensures perfect assembly of the battery at every stage.